Pan Shou was born in Fujian, China in 1911. In 1930 he came to Singapore and worked as the editor of a Chinese newspaper. Later he served as the principal of Tao Nan School and, from 1955 to 1960, as the secretary-general of Nanyang University. During his lifetime he was a prolific writer and artist producing around 2,000 calligraphy scrolls and poems! One of his calligraphic works is shown on a stamp. Pan Shou has received many awards for his works. Among these are the Singapore Cultural Medallion awarded in 1986 and the Meritorious Service Medal awarded in 1994. 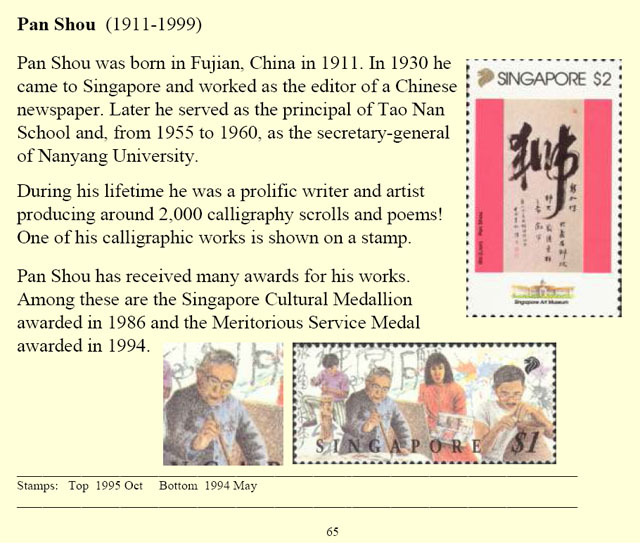 Another group of VIPs that Singapore stamps remind us of are the pioneers of the arts and culture scene. In 1979 the Cultural Medallion award was established to honour persons who have made major contributions to the arts and culture (Art, Dance, Literature, Music, Photography and Theatre) in Singapore. From 1979 to 2005, there were 86 Cultural Medallion winners. 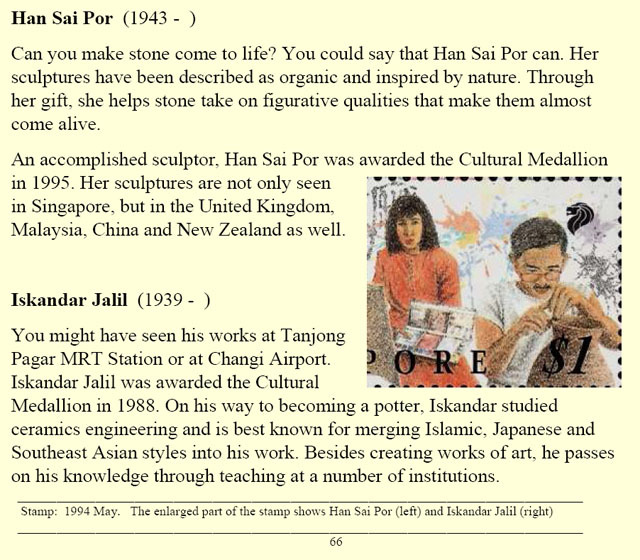 Among the arts and culture personalities featured on stamps in this section is a non-Singaporean, a world-famous writer of children’s stories, who was born in Denmark 200 years ago. Can you guess his name? 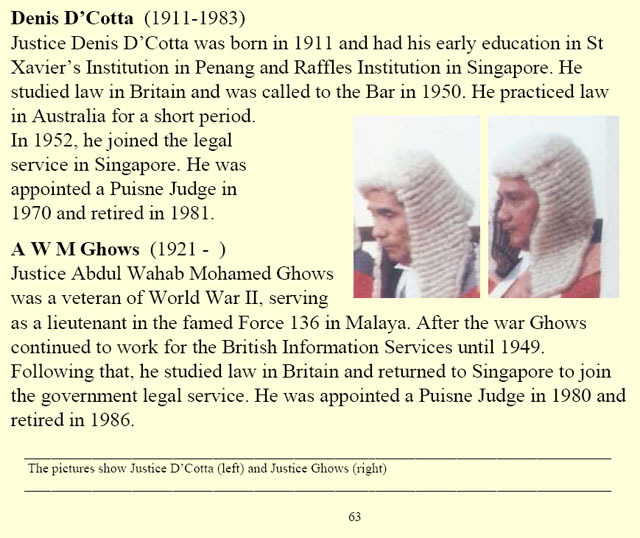 Justice Denis D’Cotta was born in 1911 and had his early education in St Xavier’s Institution in Penang and Raffles Institution in Singapore. He studied law in Britain and was called to the Bar in 1950. He practiced law in Australia for a short period. In 1952, he joined the legal service in Singapore. He was appointed a Puisne Judge in 1970 and retired in 1981. Justice Abdul Wahab Mohamed Ghows was a veteran of World War II, serving as a lieutenant in the famed Force 136 in Malaya. After the war Ghows continued to work for the British Information Services until 1949. Following that, he studied law in Britain and returned to Singapore to join the government legal service. He was appointed a Puisne Judge in 1980 and retired in 1986. 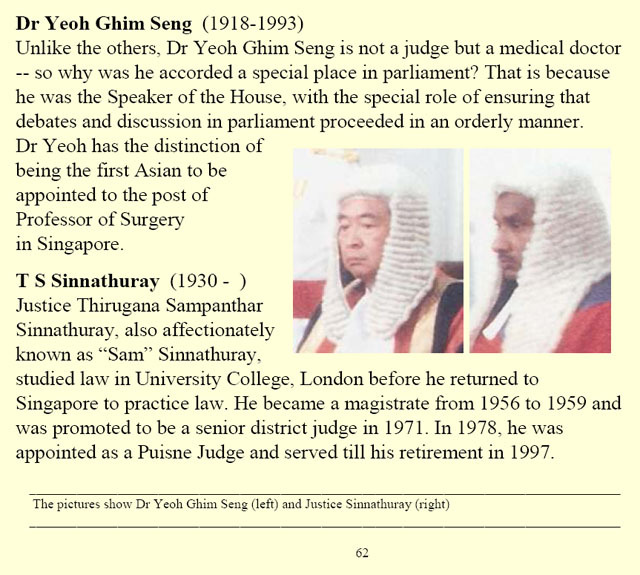 Unlike the others, Dr Yeoh Ghim Seng is not a judge but a medical doctor – so why was he accorded a special place in parliament? That is because he was the Speaker of the House, with the special role of ensuring that debates and discussion in parliament proceeded in an orderly manner. 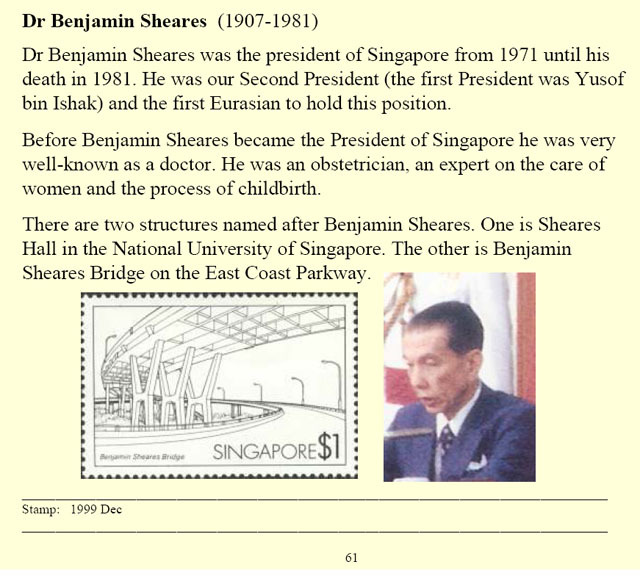 Dr Yeoh has the distinction of being the first Asian to be appointed to the post of Professor of Surgery in Singapore. Justice Thirugana Sampanthar Sinnathuray, also affectionately known as “Sam” Sinnathuray, studied law in University College, London before he returned to Singapore to practice law. He became a magistrate from 1956 to 1959 and was promoted to be a senior district judge in 1971. In 1978, he was appointed as a Puisne Judge and served till his retirement in 1997. 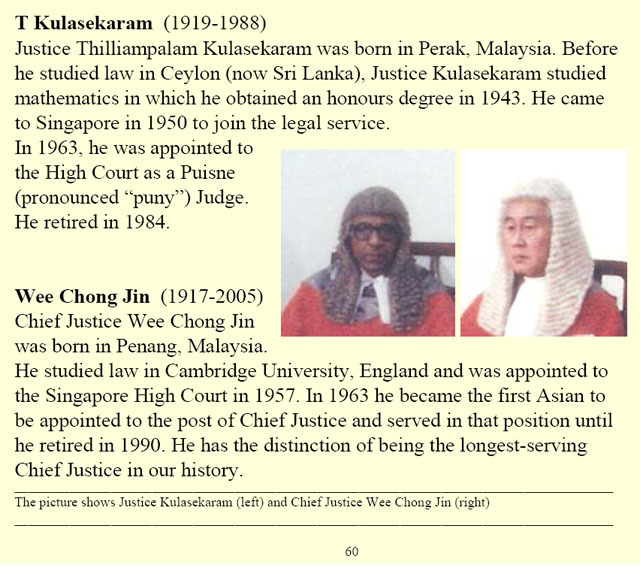 Justice Thilliampalam Kulasekaram was born in Perak, Malaysia. Before he studied law in Ceylon (now Sri Lanka), Justice Kulasekaram studied mathematics in which he obtained an honours degree in 1943. He came to Singapore in 1950 to join the legal service. In 1963, he was appointed to the High Court as a Puisne (pronounced “puny”) Judge. He retired in 1984. Chief Justice Wee Chong Jin was born in Penang, Malaysia. He studied law in Cambridge University, England and was appointed to the Singapore High Court in 1957. In 1963 he became the first Asian to be appointed to the post of Chief Justice and served in that position until he retired in 1990. He has the distinction of being the longest-serving Chief Justice in our history.